Recently I read this quote by Tom Sharp, founder and director of the London creative firm The Beautiful Meme in reference to a new co-working space he is working on in London. 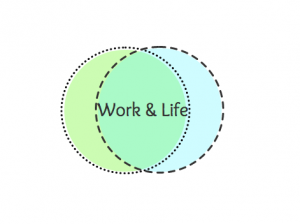 As to the first part of his statement I am right there with him – work and life are not, for me, opposing entities. My husband and I are both arts consultants and we share an office (although not a business) in our home. Much of my leisure time is spent going to colleagues’ arts event. My friends are pretty much all “in the biz” as they say. Although sometimes I need a break from it all – there is a metaphoric permeable membrane between my work and my life that is inherent to my being. As to the second part of Sharp’s quote, I would hazard a guess that the vast majority of those of us who work in the nonprofit arts sector seek to make meaning through our work. Creating art is in part about creating and/or seeking meaning from our human experience. Many go as far as to say they are are passionate about their work in the arts. We can’t all assume that work is how everyone seeks meaning. For many it’s simply how they seek money. It’s not a “marvel”, it’s a fact of life. So, in one sense, I understand exactly what Sharp is saying. However, when I read that statement a second time I was quickly humbled. Let’s read this part again “…rather than work (or rather how you seek meaning) being an integral part of your life.” For many (dare I say most) people the ability to use their work as a way to se ek meaning in life is a completely foreign notion and not even part of the equation. Work for most is about earning a living. It is a transactional activity that puts a roof over one’s head and food on the table. Furthermore, not everyone chooses to seek meaning from their work – but rather from the time not spent at work. 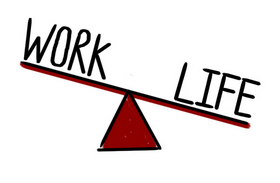 Work/life balance becomes a real thing at that point. They wonder how they can spend less time doing something that doesn’t bring meaning (no less joy) so they can spend more time doing something that does. Those of us who are able to find meaning in our work and create meaning through our work are not necessarily the norm. The desire to meaningfully integrate our work into our lives is personal. We still may have problems on the work/life teeter totter, but those problems are different from those who don’t want them sharing the teeter totter at all. The ability to seek meaning through work is a privilege shared by some but not all. Conversely, if one does not seek or find meaning through their work there isn’t anything wrong with them. I’m pretty sure this isn’t what Sharp was implying, but the sentiment is there. Sharp’s statement reminds me that not everyone has the freedom to decide what they want to do to earn a living let alone be able to seek meaning doing it at the same time. It is a 21st century concern that, in the grand scheme of things, is the purview of a very fortunate few.